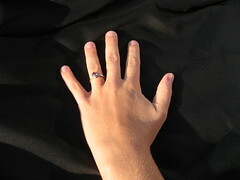 Yes I am living in the modern world I am announcing my engagement on Livejournal. Taska and I have been together for more than 10 years now. In various states of relationships. To take a more formal step to say "yes we are getting married" we are officially engaged as of today Monday 8th of October, 2007. 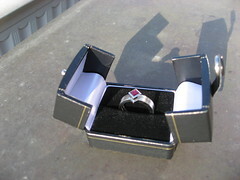 I have given her the ring as the symbol of commitment. We don't have a date for a marriage or a wedding. What we will do and what continent it will be on is still an open question, but we are committed to being together for many many years to come. For the ring I designed a it, and worked worked with a local goldsmith to make it into something real. 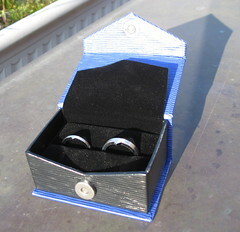 The wedding rings are also made as well. 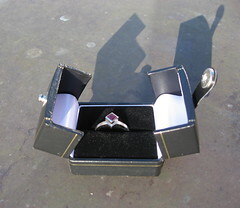 I designed it so the engagement ring and wedding ring would fit together. My ring is just a sized up version of Taska's wedding ring, and on the right you can see the wedding and engagement put together. I've seen you both grow so much as wonderful individuals within a couple. I am so very happy for you! It is exciting! It has been a long time and I think we are plenty ready. It even seems like Taska is going to get her name change done so we have one fewer complication in the whole process. Robin- now that you have finally admitted to finding true love, I think you should think about changing the name of your LJ space. Another Found Soul on the Internet??? not sure what to switch to. Robin! Why am I getting the scary picture reply? That is my "Lost Soul" picture! Things that make you go, "aw, that's so sweet..."
Re: Things that make you go, "aw, that's so sweet..."
Thanks! The Jeweler had fun making the rings too. My heart is warm when I read this. I do wish you good and peaceful times as you plan your wedding. Thanks you very much for the good wishes. Thanks! Of course you two would be invited to a party ;) We have had some thoughts of doing northern California as a party location,announcing our engagement is making it clear that a party should be on the Pacific coast. aren't you planning on moving away? But I guess still on the Pacific coast. I wholeheartedly endorse the whole getting married thing. While it almost seems like nothing when you've been living with your partner for a while making the commitment can make the rest of your life clearer. I love that you designed your own rings, they look beautiful! I definitely makes some decisions more clear, even though a number of our European friends think we are weird (they think marriage is for old people who go to church). I wish you all the best for your future together!